Welcome to Shoe String Resort Motel in beautiful Grand Traverse County in Traverse City, Michigan, where we offer comfortable and affordable lodging accomodations. Nestled in a secluded area, near Arbutus Lake, where boats can be rented for fishing on Arbutus Lake. Located in the heart of some of the finest snowmobiling and Cross Country skiing areas in Michigan, as well as viewing a gorgeous display of fall colors. Just minutes from some of the finest shopping in Northern Michigan. Nineteen clean and well equipped air conditioned 1, 2 & 3 bedroom cottage and homes, nicely furnished including linens. Remote with amenities of the city and nature, easily reached, 8 miles south of Traverse City, 11 miles Interlochen, 12 miles Williamsburg, Keystone Park 7 miles, snowmobile trails .8, Vasa Trails 6 miles. An extended stay facility, a place more home than hotel. Where lodging is available spring, summer, fall, and winter. 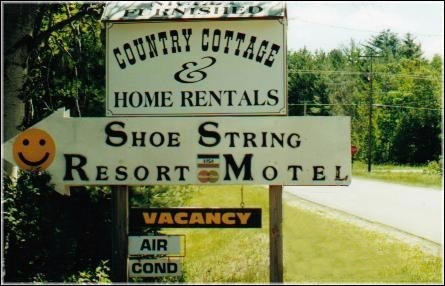 So when looking for Traverse City lodging, please give Shoe String Resort and Motel a call! You'll be sure to have a comfortable and relaxing stay.